Tonight was the monthly pick-up for Wine Club at Screwtop. We met friends, did the tasting, and then grabbed a table for a bit more wine and some food. We started with a Cheese and Charcuterie Sampler - some of which is pictured above. Photo was shot on the Canon 5DmkII, using the 50mm f/1.4, handheld. Exposure: 1/160th @ f/1.8 - ISO 100. Lit by available light - which in this case was a window camera left plus a bit of overhead halogen or incandescent lights. You can see a bit of the competing color balance - warm sparkles from the lights, plus the cooler sky colors. Minor retouching was done in Lightroom. Working the short Depth of Field again - the 50 is good for that. What do I like about this frame? I like the overall warmish, inviting colors. 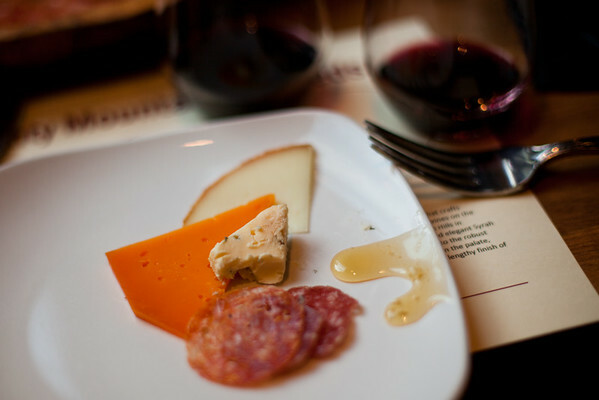 I'm a big fan of wine and cheese, so for me, the subject matter is appealing. The contrasting shapes are fun, as well. Yes, that one cheese really is that orange. And delicious too! As was the Blue. What could I have done better? I think my composition needs work. I tend to do most of my shooting with spot metering turned on, and the focus locked at the center point. I think this leads to everything being right smack in the middle of the frame. My bad habit is to just fire the frame, without recomposing to add a bit of interest. I had some of that going on here. I did do a bit of cropping, which is helped things a bit, but still, I have a lot of 'look right here in the middle' going on.